Our preparation for the Everest flight continues. Richard drove 2000 Km from England in a very nice Ducato Van provided by our sponsor FIAT to join Angelo in Rome for some critical tests before departure for Nepal. Yesterday Richard spent the day at the Italian Airforce Medical institute being thoroughly checked out, the only problem; an excess of ear-wax which was quickly solved, and he now has a certificate which qualifies him to be a 'passagero su aviogetti militari' or passenger in a military jet. This also means that they are satisfied he is unlikely to be an embarrassment by dropping dead in their hypobaric chamber. Today we spent the day at Practica di Mare air base outside Rome where we did a 'flight' in the Italian Air Force's state-of-the-art hypobaric chamber to 43,000 ft using all the equipment we plan to use on the actual flight, including masks, diluter demand valves and Oxygen bottles. 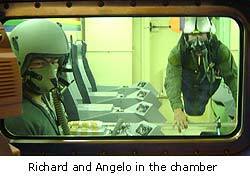 After a comprehensive briefing we were wired up with saturated O2, heartrate and respiration sensors and installed ourselves in the chamber, Richard in one of the 10 seats and Angelo hanging from the ceiling in his harness. We also had an instructor with us in the chamber to assist in an emergency and a pair of spare masked plumbed into the chamber's system in case our kit failed to work properly. 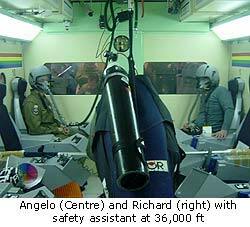 We then descended fairly rapidly to 25,000 ft where we were invited to remove our masks. At this altitude the average 'TUC' or Time of Useful Consciousness is about 5 minutes and we were given various mathematical exercises to see how we performed. 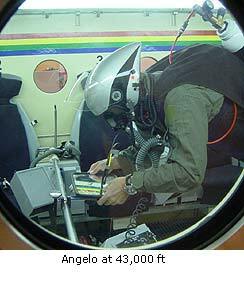 This exercise is primarily designed so each individual learns to identify his first symptoms of hypoxia (which are different for every person) and can react in time to prevent permanent disability and subsequent unconsciousness by first re-fitting the mask and selecting 'emergency' oxygen on the regulator and then possibly making a rapid descent to a safer altitude. Richard replaced his mask after about 4 minutes, the symptoms being a substantial dizziness and a mild state of euphoria. Interestingly, the tunnel vision experienced a couple of times on actual flights when the oxygen supply failed was never apparent in the chamber. 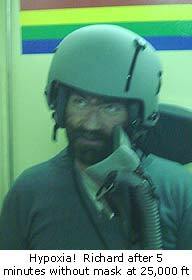 With regulators back on we descended to 18,000 ft , the lights were dimmed and again we were invited to remove our masks. At this height the TUC is about 30 minutes but we did not linger that long, the purpose of this stop was to see how one's colour vision deteriorates rapidly with hypoxia. Viewing coloured stripes painted on the wall for this purpose on the wall, the deterioration is not particularly evident but once the mask is replaced and 'emergency' oxygen selected the colours rapidly become much more evident. We then descended to ground level and a de-briefing. It is good to report that all our equipment performed flawlessly which is very encouraging for our forthcoming flight tests this weekend at Guidona air base where we will try to reach 30,000 ft.
For this test many thanks are extended to the members of the Italian Air-force for their most gracious hospitality.